Our automotive heat, sound and noise barrier is a thermal and acoustic insulation that can be used for many vehicle applications. Made from coarse denier nonwoven polyester fiber and not reclaimed cotton fibers as many other auto sound insulation products are made. It has a laminated scrim reinforced foil on one side and carpet padding exposed on the other side. 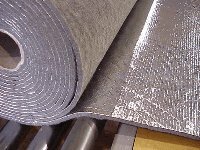 The tough aluminum foil provides a radiant heat shield which can increase R Value (Thermal Resistance) up to a factor of four, depending on the distance from the heat source. Each unit is 3' long x 4' wide (change the quantity in the shopping cart for longer continuous lengths). Easy to handle and install in any car, van, truck or SUV and no special tools are required. We recommend using Duct Tape or a strong Aluminum Foil Tape to complete the install. Made from Eco-fi™ (100% post consumer recycled plastic bottles) polyester fiber. Click here to read more about this environment friendly product. Dimension: 3' Long by 4' Wide. Change quantity in shopping cart for longer continuous lengths. Comment: Shipping was very quick. Highly recommend. Thank you. Comment: Couldnt have been an easier process, extremely happy with how your website is set up and how easy it was to find what i needed. Two thumbs up i will definitely refer people to you! Thank you! Comment: Am pleased with the level of customer service. Answered all question promptly. Carpet was shipped speedy. Comment: Very happy, fit like a glove. Comment: Very happy with your Products. This is the second time I have ordered Carpet and Floor Mats from you and I am happy to say I will be doing more business soon. Appreciate the Carpet samples before ordering. The color match is dead on. Thanks again for the quick service and a Quality product.